I've heard that a RAID hard drive is the best solution for automatic backups. What exactly is a RAID, and what are the pros and cons of RAID systems? You might think it has something to do with spraying your hard drive to remove nasty critters, but in the late 1980's, three researchers from the University of California Berkeley published "A Case for Redundant Arrays of Inexpensive Disks (RAID)" and the acronym was born. In RAID systems, two or more inexpensive hard drives are linked together to form a single large capacity storage device that offers enhanced performance. Although it can provide protection against data loss due to hard drive failure, it's not really meant to be an end-user backup solution. When RAID was first introduced, it was used mainly in large corporate settings where a large amount of data storage was needed. But in the last decade or so, due to the explosion in the usage of computers, this concept is increasingly being used in personal computer systems. Based on the approach used, RAID can be broadly classified into hardware RAID and software RAID. In hardware based RAIDs, the storage subsystem is managed independently from the host computer, and appears to the computer as a single drive. The host computer doesn't even need to know that a RAID system is being used. Some systems implement RAID with a special hard drive controller card, or the RAID functionality can be built into the motherboard. In software based RAID systems, the host computer manages the charade, making the disk array appear as one single drive to the user. The drawback to software based RAID is that it may decrease the overall performance because it uses system memory and CPU cycles. Also, the performance of software based RAID is totally dependent on the performance of the CPU. RAID 0 - requires a minimum of two disks, provides improved performance, but does not allow for data redundancy or fault tolerance. Data "striping" is used, so that each file or chunk of data is split up and written across multiple disks. The cost of this improved performace is that if any disk fails, all data stored in the RAID is lost. RAID 1 - a mirrored set of two disks minimum in which the data is replicated onto separate physical hard disks in real time to ensure continuous availability, currency and accuracy. This level provides fault tolerance from disk errors and single disk failure. To store 100 GB of data using RAID 1, two 100-GB disk drives are needed. RAID 3 & 4 - a striped set of three or more disks, in which one disk is dedicated for parity (error checking). If the parity disk fails, the array will continue without error checking. 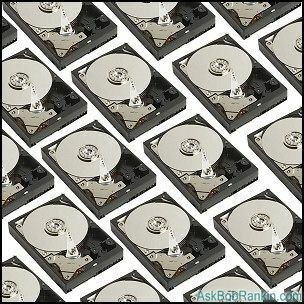 If any one of the "data" drives fails, the all data in the RAID is lost. RAID 5 - a striped set of three or more disks, similar to level 3 or 4, but the parity data is distributed over all the disks. If more than one drive fails, the all data in the RAID is lost. A single drive failure can be masked from the end user, albeit with a loss of storage capacity. RAID 6 - a striped set of 4 disks minimum, with dual distributed parity. This redundant error checking allows the array to operate with up to two failed drives. When a failed drive is replaced, the parity data is automatically reconstructed across the RAID. The type of RAID system that you use will depend on the application. For example, video processing requires fast access to large amounts of information on disk, so a striped RAID system might be appropriate. With financial transactions, data reliability is more important than speed, so a mirrored RAID approach is required. RAID is most often used in server environments, where data redundancy and fault tolerance are crucial to keeping data safe and a network of users operating with interruption. It's also a good solution for certain high-end systems that require large amounts of storage and enhanced disk performance. RAID solutions are available for Windows, Mac OS X, Linux and other platforms. Most recent comments on "What is RAID?" I didn't see any detailed instructions about setting up a RAID system for Win98. That's the OS that really needs it. Didn't want to bother with XP at 60 years old. Linspire looks promising, so I'd rather take that road when it really becomes friendly. How is redundancy achieved in RAID system? In the context of RAID what is the distinction between parallel access and independent access? What common characteristics are shared by RAID levels? I just bought a New Dell system with a Raid 0 1.28 Tb hardrive. I was told this was on one hardware hard drive,split as 2 drives 640Gig each. I think I understand this is not automatic backup. Can I install a new separate hard drive and just do an image copy of the entire 1st hard drive to the new one to make sure I have a total backup available? EDITOR'S NOTE: Yes, that's exactly right. You might prefer an external drive, so you don't have to open the system unit. I just bought a Fantom 2 TB raid drive and will use RAID 1. I bought it to backup my data and thought that I'd just use the drive for my data and let the RAID take care of the 'backup' with the mirrored data. Now, I'm not so sure. It seemed to be the easiest solution. Maybe it was the ad hype. Now, after doing some research, I'm not so sure. Someone commented about viruses. That scared me. What do you think? Use the RAID device for original and mirrored data? EDITOR'S NOTE: I don't think the virus concern is any different with RAID than it is with other types of backup media. There's always a risk that you'll back up something bad. The important thing is to have good anti-malware protection. About my backup strategy.....using the Fantom to store original data and the mirrored data as the backup. Does that sound reasonable or should I backup the Fantom, too? EDITOR'S NOTE: One thing I always recommend: backup the backup!